India solar inverter market is exhibiting remarkable growth from past few years. Further, National Solar Mission by government of India targeting 100 GW solar energy by year 2022 is anticipated to drive the growth of solar inverter market over the coming years. Rising consumer awareness, growing participation of residential and commercial segments towards solar system installations, supportive government policies & solar schemes, and private sector involvement are further contributing towards the growth of this market. Moreover, among system types, on grid systems dominates the India Solar Inverter Market Share in 2017 owing to huge adoption across different verticals, whereas, off grid systems are majorly limited to rural electrification applications only. 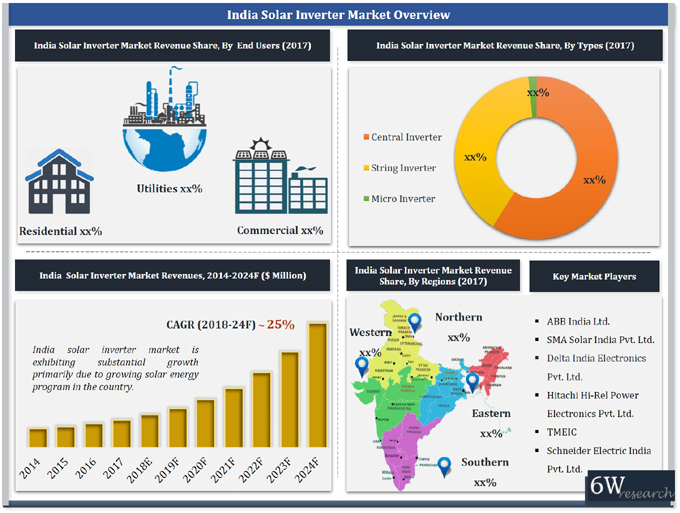 The India Solar Inverter Market Report thoroughly covers India Solar Inverter market by types, system types, end users, power rating, and regions. The India Solar Inverter Market Outlook report provides an unbiased and detailed analysis of India Solar Inverter Market trends, opportunities/ high growth areas, market drivers which would help the stakeholders to decide and align their market strategies according to the current and future market dynamics. 14.2	SMA Solar India Pvt. Ltd.
14.3	Delta India Electronics Pvt. Ltd.
14.4	Chint Electric India Pvt. Ltd.
14.5	Schneider Electric India Pvt. Ltd.
14.6	Hitachi Hi-Rel Power Electronics Pvt. Ltd.